Of noble and distinguished parents, Euthymius was born in the Armenian town of Melitene near the Euphrates river about the year 377 A.D. He was the only child, a son, born in answer to the prayer of his mother Dionysia, who had a heavenly vision regarding the birth of Euthymius. From his youth, he lived a life of asceticism, at first in the proximity of his town [Melitene] but then, after he visited Jerusalem at age twenty-nine, in the desert between Jerusalem and Jericho called Pharan. He filled his days and nights with prayer, internal thoughts about God, contemplation and physical exertion. Around him many disciples gathered some of whom are glorious saints, such as Kyriakos the Hermit, St. Savvas the Sanctified, Theotictus and others. By God's gift, Euthymius was a great miracle worker; he expelled demons, healed the gravely ill, brought water to the desert, multiplied bread and prophesied. He taught monks the love of labor saying, "If you eat bread, not of your own labor, know that you are eating of someone else's labor." When some of the younger monks wanted to fast more than others, he forbade them to do so and commanded them to come to the communal table so that they would not become prideful as a result of their excessive fasting. He also said that it was not good for a monk to move from place to place, for he said, "A tree frequently transplanted does not bear fruit. Whoever desires to do good, can do it from the place where he is." About love, he said, "What salt is to bread, love is to other virtues." During the first week of the Honorable Fast [Lenten Season], he retreated to the desert and remained there in solitary silence and godly-thoughts until just before the Feast of the Resurrection. During his life time, a large monastery [Lavra] was established in the proximity of his cave which later, throughout the centuries, was completely filled with monks as a beehive is filled with bees. His final command was that the monastery always adhere to hospitality and that the gates of the monastery never be closed. He died at the age of ninety-seven. The Patriarch of Jerusalem was in attendance at his funeral. The patriarch waited all day long until the great masses of people reverenced the body of the saint and only in the evening were they able to complete the Office for Burial for the Dead. 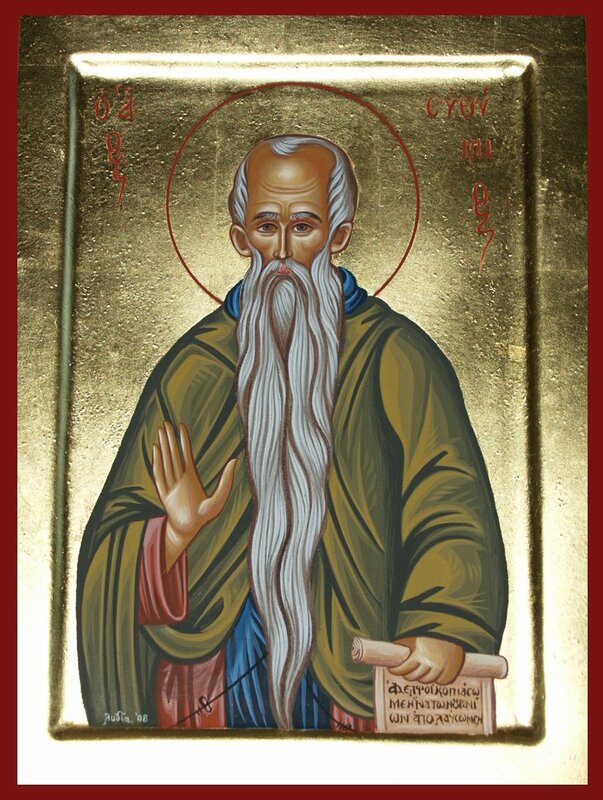 On the seventh day following his death, Euthymius appeared radiant and rejoicing to Domentian, his disciple. 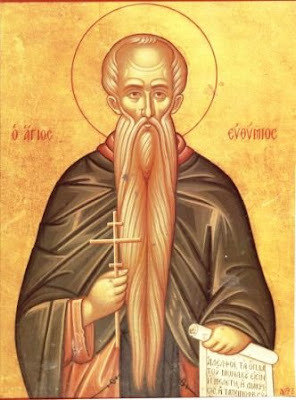 The Venerable Euthymius, in truth, was a true "son of Light". He died in the year 473 A.D.
As much as the saints were so compassionate and lenient toward human weakness, so were they terribly unyielding and unbending in regard to the confession of the true dogmas of the Faith. Thus, St. Nicholas of Myra in Lycia struck Arius with his fist at the First Ecumenical Council [Nicaea, 325 A.D.]. 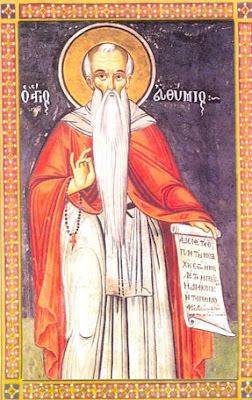 St. Anthony left his desert to come to Alexandria to publicly unmask Arius. 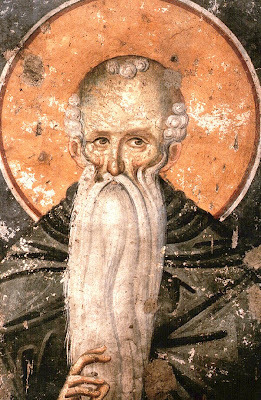 St. Euthymius, being greatly pressured by the Empress Eudocia and the pseudo-Patriarch Theodosius and being unable to debate rationally with them, left the monastery and hid in the desert. All other distinguished monks followed his example. Euthymius remained in the desert until the pseudo-patriarch was ousted and Orthodoxy strengthened. When, in Jerusalem, the greatest agitation surfaced in the name of the emperor against the Fourth Ecumenical Council [Chalcedon, 451 A.D.] and when the entire population was frightened by the heretics, then St. Theodosius the Great already burdened with old age, as a fearless soldier of Christ, came to Jerusalem, entered the Great Church, ascended the stairs, waved his hands and said to the people, "If anyone does not respect the Fourth Ecumenical Council as he does the four evangelists, let him be anathema." (Until this time, only four Ecumenical Councils had been convened). All of those listeners were frightened by those words and none of the heretics dared to say anything contrary to those words. Without changing place, they are in every place. He reaches wherever He wants and He reaches when He wants. O, who will His footsteps and paces know? Who could enumerate His paths and places? He cuts out the paths and reveals the direction. And does not allow not even an ant to stay. For eighty years on earth, dedicated to Him. Be glad, O barren one, that hast not given birth; be of good cheer, thou that hast not travailed; for a man of desires hath multiplied thy children of the Spirit, having planted them in piety and reared them in continence to the perfection of the virtues. By his prayers, O Christ our God, make our life peaceful. Creation found delight and joy in thine august nativity and the good cheer of thy numberless miracles on thy divine memorial. Now bestow thereof richly on our souls and wash clean the stains of our every sin, Euthymius most righteous, that we may chant: Alleluia!